This large inflatable tent is made with PVC tarps, double stitching everywhere and fourfold stitching at the stressed points. Good material with skilled sewing works makes the inflatable event tent good quality. For this inflatable tent, there are sky windows on the top so that the lights can get inside. Besides, there are wire holders on the top. You can set wires and link lights inside the tent. The back is completely closed, but in front, there are 2 entrances, one small for people and one big enough for the trucks get into the tent. 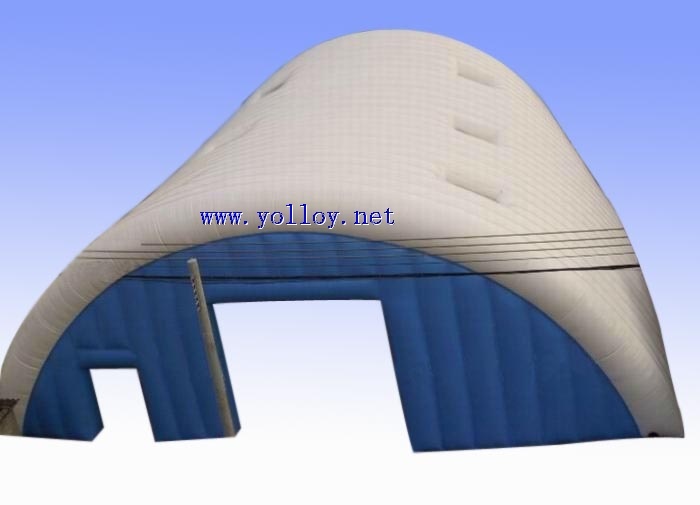 For this large inflatable tent, you can use it as inflatable museum, or inflatable sport hall, inflatable storage, inflatable garage and so on, The material is waterproof, uv-resistant and can be used for the temperature of -15°to +75°. Customized can be acceptable.If you are interested in it, please advise the size you will in needed,we would like to work with you for a suitable tent you want.